Two weeks ago, The History Channel aired a fantastic documentary about the science of the final frontier – Star Trek: Secrets of the Universe. If you haven’t seen it, watch the 90 minute video for free on their website. If you're new to Star Trek, Secrets of the Universe gets you up to speed on the scientific foundation of the franchise. Through interviews with expert scientists, you'll learn about starship design, interstellar travel, planetary science, advanced propulsion, and the search for extraterrestrial life. You'll also get to hear A LOT of scientists geek out about how they were inspired to do what they do because of Star Trek (which is always a heartwarming for me since I had the same experience). 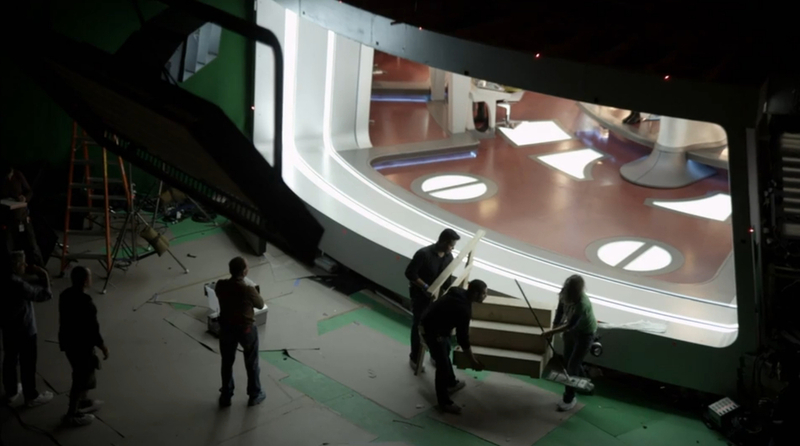 Behind the scenes of the Enterprise bridge. Trekkies will love the beautiful behind the scenes footage from the making of Star Trek Into Darkness and the interview with J. J. Abrams. I’d even go as far as saying the Abrams interview will be healing for fans who were outraged over Abrams’s admission that he "never clicked" with Star Trek. Secrets of the Universe reassured me that that Abrams completely respects Star Trek and believes in its optimistic vision of united exploration. Look how happy J. J. Abrams is creating his infamous lens flares! There's just one thing that bugged me and it's a doozy – the documentary completely ignores the science of Star Trek’s optimism! Even if we invent the warp drive, build starships, and travel to other worlds, we're still going to destroy each other or kill extraterrestrial life if we don't implement the psychology of peace. Secrets of the Universe alludes to the dangers of alien first contact by describing our history of failed first encounters between cultural groups (see Columbus), but it doesn't have any psychologists talking about why first contact is difficult and what can be done to improve it. Star Trek isn't about technology. It's about the evolution of our culture. To achieve Star Trek's utopia we’ll need to end prejudice, foster cooperation, and develop empathy for others. It’s not impossible – we have decades of brain and behavioral science showing us how to make it so. 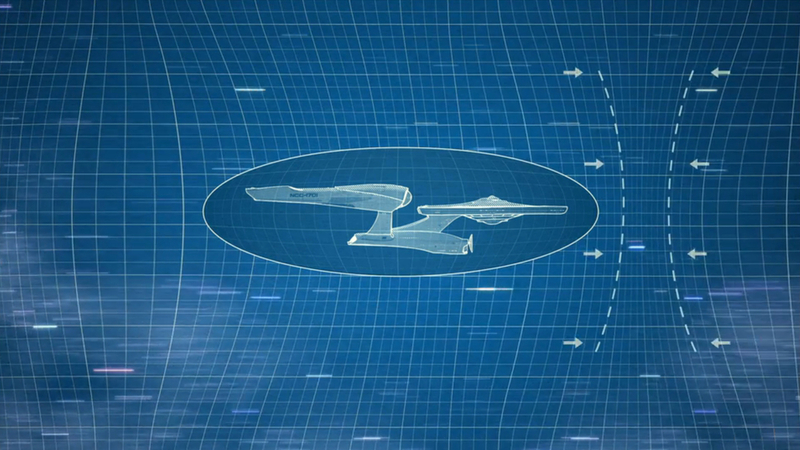 Star Trek: Secrets of the Universe beautifuly explained the warp drive (increase space behind you and decrease it in front of you), but it neglected the science of peace and cooperation. I still highly recommend Star Trek: Secrets of the Universe. I watched it twice and have no plans to remove it from my TiVo anytime soon. It’s a fascinating window into the science of our future. I just wish it had a scientist talking about how we can achieve the most important part of Star Trek – people working together to boldly go where no one has gone before. Below are my favorite quotations from Star Trek: Secrets of the Universe. "I think the main thing was to completely break from the old Buck Rogers notion of these arrow shaped ships landing on their tails. The Enterprise, it's a naval ship. It's like Captain Cook discovering Australia, or the HMS Beagle, which carried Charles Darwin. These ships they had war fighting capacity but in addition they carried scientists. The captain he could sign treaties, he could negotiate. This naval vessel contains our civilization and this is how we're going to travel between stars." "Imagine you wanted to move a car across a landscape. The warp drive idea is to say you manipulate the landscape and carry a chunk of land and move that and the car just rides along with it…You're no longer moving through space-time, you're moving chunks of space-time itself and the rules [of relativity] are different for that." "What if we're the first to make it to the other side and make a civilization like the Federation in Star Trek, and what if everybody out there is waiting for us to do that – to go out and rescue them, to show them the way? That's a scary prospect. That's a burden. I think we can take it on. I think we can do it." "Star Trek is the inspiration for my life, it really is. What you guys are doing here [filming Star Trek] isn't just [creating an] incredible, spectacular movie...but [you're] inspiring a whole new generation of kids, like [me] when I was a little kid." "I think as a kid I was more inspired by science fiction that I'm sure had been inspired by actual science. The idea of genetic mutation for example - extrapolate that and you have Godzilla or The Fly. The idea of space travel, what does it mean to be isolated for such a long time, inspired Rod Sterling to write the pilot for The Twilight Zone. Those are quantified examples of science inspiring entertainment that inspired me." "Roddenberry’s vision of the future was optimistic. His conceit was that there was no more conflict. It's a hard thing to be a parent and not desperately hope for a future that is as close to Roddenberry's as possible." "I think when you look at what it is that Roddenberry wrote about going boldly where no one has gone before, humanity is trying to do that. I would hope we'd get the resources and the technology to travel to other moons, planets, and solar systems. It's an incredibly exciting to think what's out there." "It is an absolute impossibly to look into a night sky and see all the stars and understand that each one is a sun and not know for a fact that we are surrounded by life everywhere we look. For anyone who looks out at those stars and is self-involved enough to think we are the only life in the universe is, I think, really misguided." "It's a fascinating thing to work on a movie like Star Trek Into Darkness because it's science fiction but it's based on principals and ideas that I think are widely compelling which is people, all of us, working together that we are unified to explore this universe. There is something deeply relatable and a human natural curiosity - that when you actually think about it 'Oh my God, going off into space' - it's mind-blowing." "I think it's human nature to see a place in the distance and that place in the distance is never just a place it's always a destination. Humanity would never identify a place and not attempt to go there. Not to conquer, not to transform it, but to explore it."